I am sure this is a common issue? 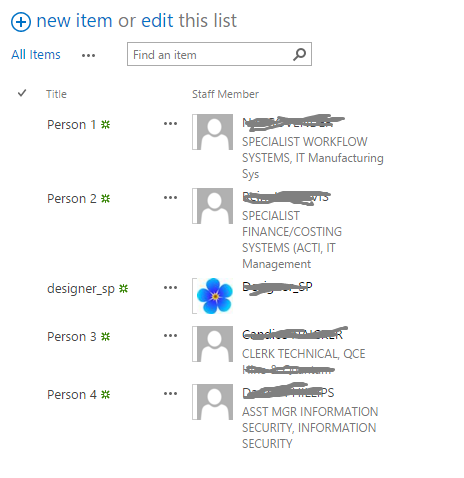 We have a whole bunch of users whose profile pictures from their mysites is not appearing in any list where we have selected a peoplepicker and "Name (with picture and detail)". Some peoples pictures appear fine. Users do all have profile pictures which show up if you click on their name and get taken to the mysites. Hope someone can help! Thanks a stack! Edit: mysites is running on port 443 so pictures being "pulled" from there, not sure if this helps? Also, the peoples profile pics are being displayed when we do a people search. Check the User Profile Synchronization service is running for the specified web application. If not, please run that service. That'll update the user images to the SharePoint site. It is not easy to troubleshoot the such issue. Troubleshooting should be done in this way. Make sure User profile Sync service is running and when the last Full or incremental sync completed. if it is long time for sync then please run full sync. Now go to User information List( http://sitename/_catalogs/users/detail.aspx) and check if the User Profile Picture displayed properly here. if picture displayed here then I think recreate a the Custom list. Now from central admin from user profile service, under the managed property> edit the picture property.On this page under policy settings if replicable is select or not. select it if not. lastly check the Event / ULS logs for any possible error. Not the answer you're looking for? Browse other questions tagged userprofiles or ask your own question. Edit SharePoint 2007 Profile PersonalSite by code? How to customize the User Profile Page(About me Page) in SharePoint 2013?